The statuette that will be handed to the biggest pop stars in the world next February has been released and has been created by Zaha Hadid Design, in what was one of the last commissions accepted by the British/Iraqi architect in January before her shock death from a heart attack at the age of 65 in March 2016. 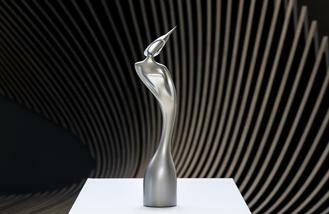 The BRIT design project was led by Maha Kutay, Director at Zaha Hadid Design, and Niamh Byrne, on behalf of The BRIT Awards, since Hadid personally accepted and commenced on the brief in January of this year. The finished statues were photographed this week by Luke Hayes at the Zaha Hadid Design Gallery in Clerkenwell. Speaking about the finished results BRITs Chairman Jason Iley- who is also CEO and Chairman of Sony Music UK & Ireland - said: "We are delighted with the finished statues. Like Zaha, they are innovative and original and have gone well beyond our expectations to create something special that will progress the Award into the future. I'd like to especially thank Maha and Niamh for all of their hard work and support over the last year." Zaha's team produced a family of 5 statues, a concept that Maha says "represents diversity". Speaking about Zaha's vision for the statue, Maha added: "Zaha was truly excited to be doing this. Her vision was, being an architect, to focus our efforts more on the 3D element, as the statue had previously been used as a canvas for artists to paint on for the last few years. Our design expresses Zaha's unwavering belief in progress and optimism for the future and a break from the norm. The biggest challenge was to create something different within certain guidelines, yet achieving a result recognisable to the public. You have to respect the existing to create something new." The 2017 Critics' Choice Award shortlist will be revealed on Friday (02.12.16) and the winner will be announced on Thursday 8 December. That winner will be the first recipient of the new statue. The BRIT Awards 2017 with Mastercard will be broadcast live on ITV on Wednesday 22 February from The O2 in London.